Maximizing your Internet speed is a crucial step in the quest for a faster computing experience, and one of ever increasing importance because just about all we do with our machines nowadays we do while connected to the web. To help satisfy your ongoing need for better broadband, NetBooster® has been re-architected with a whole new set of TCP/IP optimization tests and network setting modifications specifically for Windows versions all the way through Windows 10. The feature has both an automatic and a manual mode, allowing you to individually optimize for specific use cases, e.g., streaming, gaming or large file transfer. Here are just a few highlights of what this powerful tool can do for you. Before a browser can establish an Internet connection, it must resolve the DNS name of a local web server to your computer’s specific IP address. DNS servers are the essential intermediaries that link your system to virtually all of the resources scattered across the web. It’s important to make sure the DNS server selected is the fastest possible one available in your area—a task your Internet service provider does not bother to do. And since many DNS servers are in the public domain, software that finds the fastest one available for a given ISP with a specific connection in a particular location at a certain time of day is an elegant solution to an easily identified but fairly complex problem. NetBooster uses this precise strategy to help optimize your Internet connection—in this case, with an overlooked available resource right outside your home. By searching for the fastest possible DNS server in your area and letting you simply click to connect to it, NetBooster can deliver increased network speed, so you can enjoy less buffering delays and greater bit resolution in online streaming and TCP-bound gaming. In addition to outward-reaching solutions to Internet speed optimization, breakthrough iolo Labs research has unearthed a whole cache of underperforming Windows Internet settings within your computer, and they too are crying out for optimization. Regardless of how new your OS may be, when these hidden settings are adjusted correctly, the difference in your Internet experience can be significant. Recent benchmark tests comparing NetBooster’s adjustments to the default settings show boosts in download speed by an average of 23%, and by as much as 37%. * Let’s look in detail at what two of the most critical of these settings can do. Data is transmitted across the Internet in packets. One way to increase the efficiency of this process is to discover the largest possible size (in bytes) a data packet can be for a given network before it has to be broken up to transmit. This value, often determined by your router, is called the Maximum Transmission Unit (MTU). NetBooster automatically discovers this value, takes the MTU setting in Windows out of “autotune” mode, and fine tunes it, helping to eliminate data fragmentation at routers and so reducing network congestion. An engineer named John Nagle invented a way of increasing TCP/IP network efficiency by reducing the overall number of packets that need to be sent over a network. It works by coupling very small data packets together, but often at the expense of real-time responsiveness because the algorithm delays in sending small outgoing messages until they collectively reach the desired amount of bytes to make them “worth” sending. Some networked multiplayer video games can suffer from Nagle’s algorithm because these programs assume gaming actions are sent immediately, not in delayed coupled packets. Therefore, disabling the algorithm can help eliminate the stuttering time delays in gaming known as latency. De-Nagling improves TCP-bound, networked games like World of Warcraft, Guild Wars 2, Eve Online, and Flash-based games such as League of Legends. NetBooster lets you control when and if you decide to De-Nagle, as disabling Nagle’s algorithm may negatively impact large file transfers in a very high latency network. 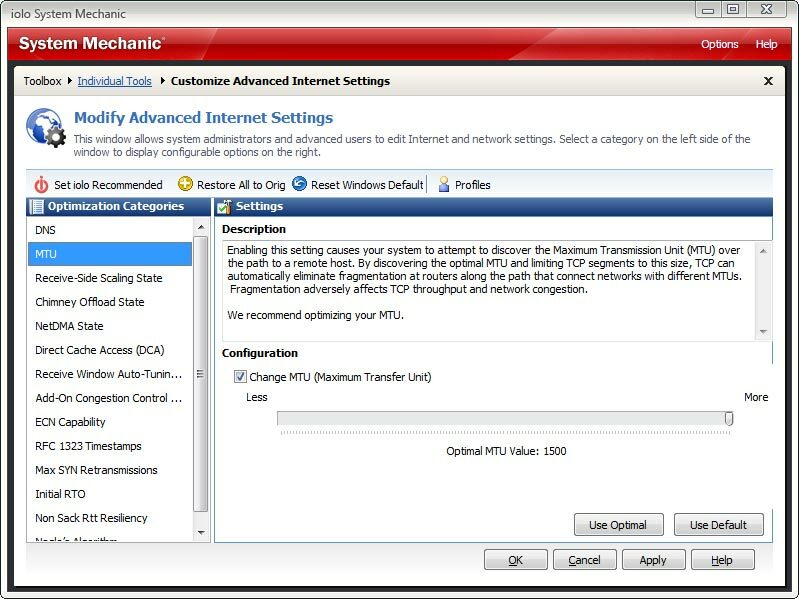 No less than 14 total settings within Windows TCP Global Parameters can and should be adjusted from their default settings to best handle network traffic on your particular system. NetBooster automatically sets each of these to their optimal values. Alternately, by choosing “Customize Advanced Internet Settings” you can manually adjust each value yourself. Within this interface, the “Restore All to Orig” button allows you to easily revert to NetBooster’s original configuration if after tweaking the settings you experience problems with the network. 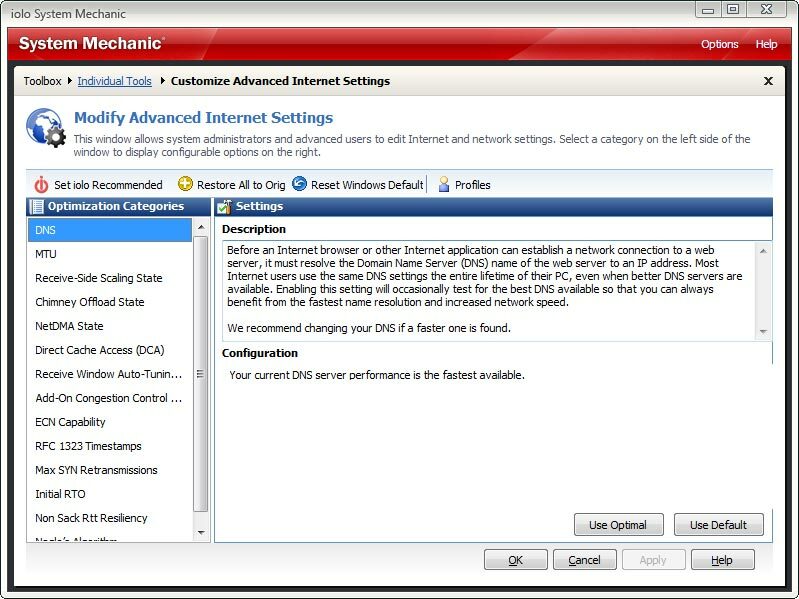 In future articles and tips, we’ll walk through several of the features advanced users can access in NetBooster’s manual mode to finely adjust Internet settings to meet their specific network needs. Instead of putting up with the bitter indignity of an underperforming Internet stream, System Mechanic users can deploy NetBooster to help gain significant, welcome increases in Internet speeds, resulting in improved bit rate and picture quality of TCP-bound videos and games, less time in the dreaded “Buffer Zone,” faster downloads, snappier page loads, and an increased rate of large file transfer. In System Mechanic, click Toolbox >> Individual Tools. 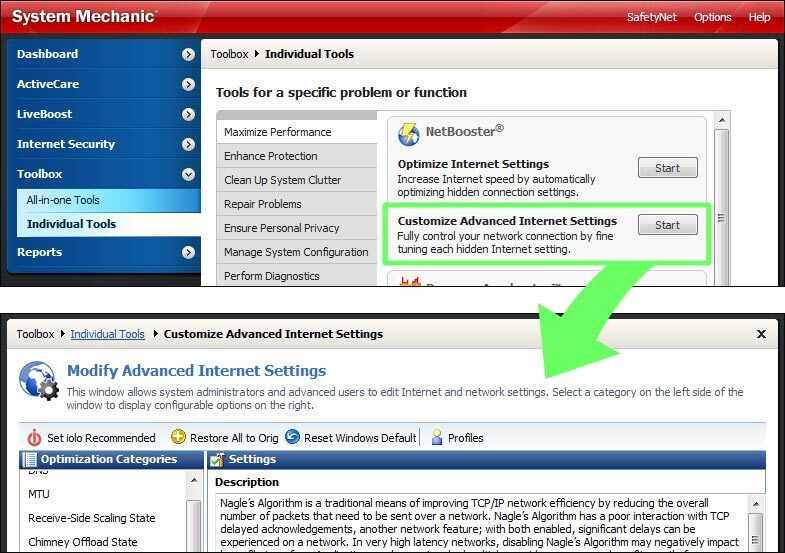 Navigate to NetBooster >> Optimize Internet Settings and click Start. 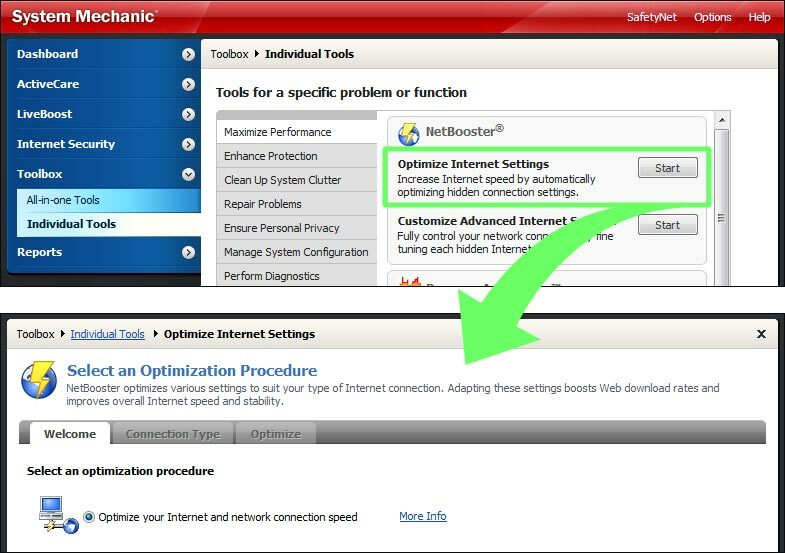 Choose Optimize your Internet and network connection speed and click Next. Select your connection type. Most users will choose the first, default option under High-speed or broadband connections. Click Next. NetBooster will automatically adjust settings to maximize your Internet speed. A system restart may be required. In System Mechanic, navigate to ActiveCare and then click Automated Tasks. Locate the task Optimize Internet configuration and ensure its toggle switch is set to Enabled. *Based on averaged test results from NetSpeed Analyzer, CNet Speed and AT&T Download Tests conducted Nov.-Dec. 2014 on HP Pavilion a6720y running Windows 7 64-bit with WiFi Internet. Individual results may vary. **World of Warcraft was tested on Oct. 20, 2014 on a 64-bit Windows 7 PC with a 65 Mbps WiFi connection. In-game latency reports and Wireshark packet analysis reported game latency reduction from 100~ ms to 80~ ms. Individual results may vary.